A doctor asked her office manager how she was feeling one day – and never imagined this simple question might save a life. But the question set a series of events in motion. And before long, Dr. Melanie Altizer had volunteered to give a kidney to her office manager, Marianne McGiffin. “Amazing, above and beyond,” McGiffin said of Altizer, her friend and co-worker. Altizer’s gift was a remarkable act of generosity. But fortunately, many others also make the choice to donate a kidney to a family member, a friend, or even someone they don’t know. Dr. James Huang, who performed the kidney transplant operation at TGH along with Dr. Heidi Pearson, said these donations are vitally important because "a healthy kidney from a healthy person works better, it works faster and it works logner." Huang said he is always impressed by the generosity of people like Altizer. “Donors are oftentimes selfless people, they just want to help someone,” he said. McGiffin had battled kidney disease for years. It worsened to the point that doctors told her she would need a new kidney to survive. She is not the type to share her troubles. Her husband Steve and several family members knew her condition and volunteered to help, but they all had a different blood type, which prevented them from donating. So she continued working each day, as an officer manager at a medical practice in Fort Myers, and hoping for relief. She did not mention her illness often. But one day, when she wasn’t feeling well, one of the doctors asked how she was doing. The doctor was Altizer. She kept asking more and more questions, until the whole story came out. Perhaps that’s not surprising because the two, both friendly, outspoken and from Italian families, had felt a close bond since they had met less than a year earlier. They quickly learned they both had O + blood. Like many people, Altizer had registered to be an organ donor. But that meant donating her organs if she died. She had never really considered donating an organ while still alive. “When I started doing some research about living donation I was shocked at how safe it really is,” Altizer said. Altizer discussed the matter with her wife, Trish Conner, who was supportive. She decided she was going to donate. Altizer and McGiffin’s research led them to Tampa General, which has performed more than 10,000 transplant surgeries and is one of the busiest transplant centers in the United States. 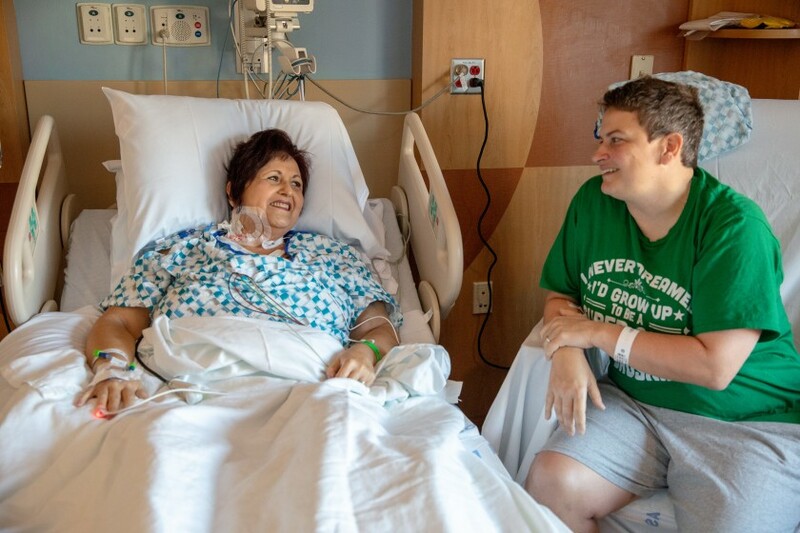 Both felt comfortable at TGH, not only because of surgeons like Dr. Huang and Dr. Pearson, but also because of the way the transplant support staff worked so closely with them to prepare. As McGiffin waited for surgery, she needed to go on dialysis for a few weeks, which left her feeling sick almost all the time. Altizer and McGiffin had their operations in February 2019. Altizer felt well enough to go to a concert featuring Pink the following weekend. A few weeks later, both Altizer and McGiffin participated in the 2019 Fort Myers Kidney Walk. who performed their kidney transplant. Both women are now working to share the message that living organ donations can save lives. Because most people are born with two kidneys, they remain in good health after donating one of them. Other people may donate a portion of their liver, because it can be transplanted and save the life of someone with liver disease.